The latest scandal, that certain political leaders illegally and secretly manipulated citizenship grants in order to shift the balance of votes in their favour, is beyond outrageous. The full scope of their treachery might never be known. What is particularly galling is that despite all the publicity, despite the fact that we are about to head to the polls, it’s still business as usual. It speaks of an overbearing sense of impunity and an utter disdain for the people of Malaysia. It is mind-boggling, as well, that Malaysia, according to the international financial integrity watchdog Global Financial Integrity, is now second only to China in the outflow of illicit funds. Untold billions have been looted and squirreled abroad even as our nation sinks further into debt. At this rate, the day of our economic reckoning, a reckoning that will fall primarily upon the shoulders of the common people, cannot be too far off. The carnage that decades of misrule has wrought is now evident in nearly every area of national life – the justice system, the police force, the civil service, the Elections Commission and the Anti-corruption commission. Abroad, meanwhile, Malaysia is increasingly seen as a nation in decline. Each year we sink lower and lower in critical benchmarks for corruption, transparency, good governance, education, human rights and press freedom. Where once we ran with the best, we now hunker with the outliers; where once we benchmarked ourselves with the finest, we now settle for being a cut above the worst. Part of the problem is that we, as a nation, have for too long put our trust in personalities and political parties rather than in the kind of institutions that alone can guarantee our democracy and help ensure good governance. So enamoured were we with personalities that we did little as the caudillos undermined our national institutions and weakened the fabric of our nation. We unwittingly traded our fundamental freedoms for short-term prosperity and stability. And now, we, like many other nations before us, have discovered the truth of Benjamin Franklin’s axiom that those who trade their freedom for temporary security deserve neither and will lose both. Only strong democratic institutions can help ensure that a nation survives the corrupt or ineffectual leaders that democracies tend to throw up from time to time. America, for example, could survive Nixon because its democratic institutions were strong, whereas the Philippines collapsed into chaos together with Marcos because its institutions were weak. The reality is that power is always highly corrosive and corrupting, and must be kept in check by strong democratic institutions and traditions. History clearly shows that, absent an effective system of checks and balances, today’s reformers could well become tomorrow’s abusers. While the upcoming general election will, in the first instance, be a contest between personalities and coalitions, their respective policies on the central issue of democratic reform will be the key to our future. The task is, admittedly, huge – dismantling institutionalised cronyism and injustice, re-establishing standards of good governance, rebuilding all our national institutions and forging a new national consensus. Happily, there is now a resurgence of confidence and optimism that it can be done, that we are possessed of the resilience, fortitude and basic solidarity necessary to overcome the challenges that years of misrule and division have wrought. The mass outpouring of support for BERSIH and other citizen initiatives clearly demonstrate that people are not going to keep silent anymore, that enough is enough. 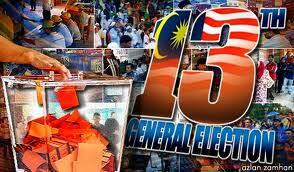 Equally important, there is now, in the PR, a genuine, viable and credible alternative to BN. They have already far surpassed the BN in their transparency, management and good governance in the states they now rule despite harassment, sabotage and black propaganda. The choice before Malaysians is, therefore, both clear and stark – we either vote to rebuild our democracy or vote to diminish it further. The choice we make at this election will forever define our nation. It is an utterly false posit, for the choice before us is not between two devilish alternatives but between fear and hope, between tyranny and democracy, and between our worst instincts and “the better angels of our nature,” to quote Abraham Lincoln. It’s time to rededicate ourselves to that unfinished task. Very good read Dato and my name sake. . We must rise to make this nation an Asian Tiger it was once known to be.